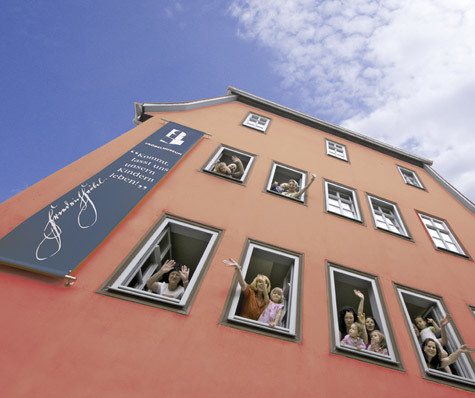 The Friedrich Froebel Museum brings the beginnings of what is nowadays commonly referred to as “Kindergarten” to life. Its concept was first set up by Friedrich Wilhelm August Froebel in 1839 at the "House above the cellar" ("Haus über dem Keller"), where he began to carry out his program designed for the education and upbringing of young children. His conceptions on theory and practice of the kindergarten, which both take into account the individual character of each child and are intended to convey basic competences and to strengthen the parents’ involvement into the process of upbringing, led to far-reaching modifications of educational theory and practice all across the world. Still to this day their relevance has remained undoubted. Being a vital venue and center of education, the museum and its many diverse offers are closely linked to Froebel’s credo “Come, let us live for our children!” (“Kommt, lasst uns unsern Kindern leben!”).